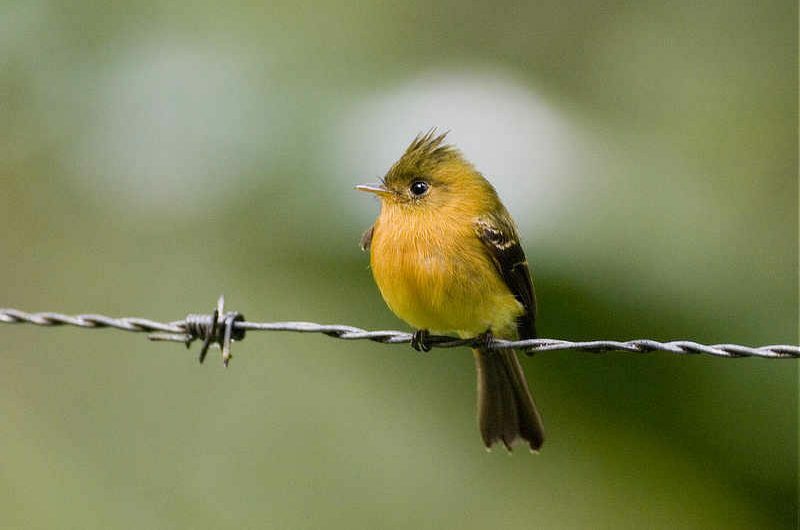 A small, plump flycatcher of the wooded foothills, the cute Tufted Flycatcher is olive-green above with 2 grayish-olive wing bars, an ochre-orange breast and distinct pointed crest. It perches on small branches in the mid-story of the forest, periodically making sallying flights for small insects, similar to wood-pewees. It frequently calls, giving a series of high pip notes. It ranges throughout the Pacific slope of Central America and northwest South America from Mexico to Ecuador. This resident species is one of the many flycatchers that can be encountered in Panama, and is common in the cloud forest surrounding the Canopy Lodge. Rare Sighting: Tufted Flycatcher is an occasional vagrant to the southern U.S., and there have been several records of this species in Arizona and Texas.